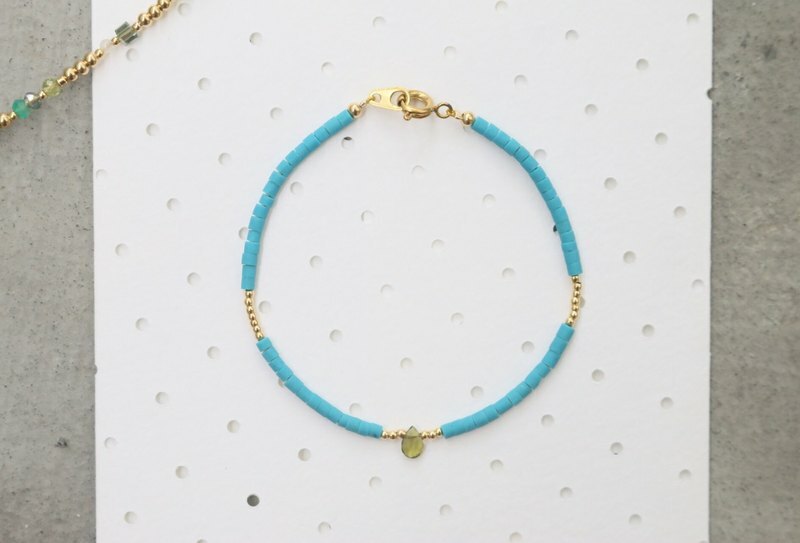 Delicate bracelet with 2mm dyed blue coral,2mm gold plated beads and a faceted tourmaline drop.A beautiful, elegant piece that looks great alone or in a stack. • Handmade item • Materials: Coral,tourmaline,brass. ................................................................. // p a c k a g i n g // All jewelry items are shipped in our beautiful blue custom gift packaging and carefully wrapped to help ensure safe travels. A note can be enclosed at your request. Spending over $35 free cotton bag https://c1.staticflickr.com/1/479/31523541635_e46043d0f7_b.jpg //r u s h . o r d e r s // If you need your jewelry order rushed, please contact me prior to purchase to confirm arrival date. //i n f o . a b o u t . m a t e r i a l s // Keep all jewelry in dry storage and do not expose to prolonged periods of time in water. Storing in sealable plastic bags will help prevent metals from tarnishing. Being kind and mindful of your jewelry will help prolong their life. If brass becomes tarnished as a result of discoloration or oxidation, please use a silver cloth and wipe the jewelry in one direction. This should restore luster to the brass.